We make our Pho from fresh ingredients, some of which are grown right here on our property. If you check out our Menu, you will see all of the different options available. The noodles are cooked and often seasoned using fish sauce. Then the dish is garnished with fresh herbs, cilantro, basil, bean sprouts, limes, peppers and other delicious addons. Pho is especially great when the weather is cool. A hot tasty bowl of Pho with your favorite meet or just veggies, mix in a little chili pepper to give it some heat and you will be on your way to happiness. That is not to discount it being great for warm weather as well. Come in and try it out for yourself, it’s never too late for a new favorite food. 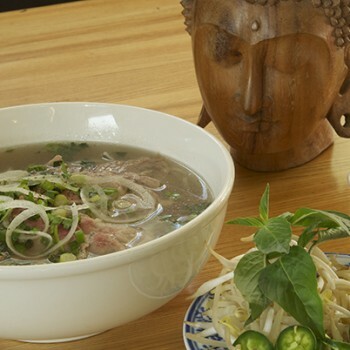 $25 gets you one massive bowl of Pho. Free if you finish + $50 So Ba gift certificate. Can you handle the challenge?